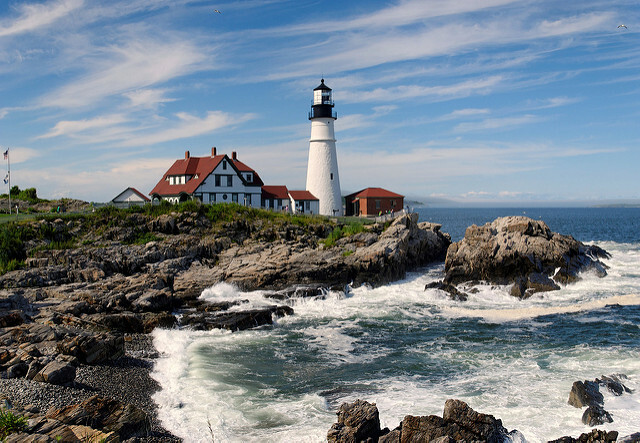 The 10 Best RV Trips To Take In Maine - Must See! Known as “Vacationland,” Maine is truly the ultimate destination for your RV road trip. 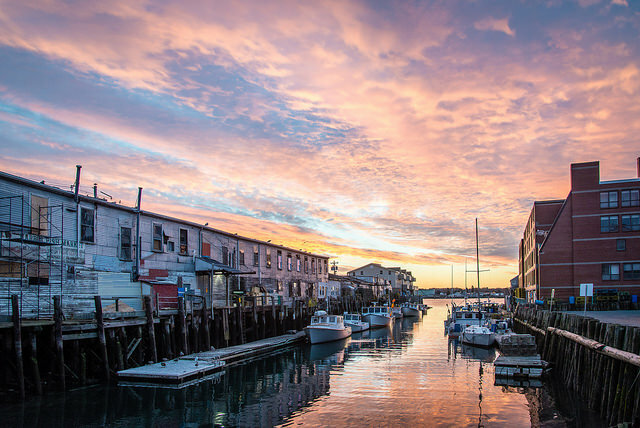 With thousands of miles of picturesque rocky coastline, idyllic mountain views surrounded by pine trees, and a small city with an incredible craft brew and foodie scene, Maine has something for everyone from young children to retirees. Acadia National Park is the oldest national park east of the Mississippi River. Encompassing more than 47,000 acres across Mount Desert Island, Schoodic Peninsula, and Isle Au Haut, Acadia National Park became the second national park in the country in 1919. Much of the park’s design and features are the way they are is because of private donations from America’s wealthiest, like George B. Dorr, Charles W. Eliot, and John D. Rockefeller, Jr.
Acadia National Park is a hiker and biker’s paradise. 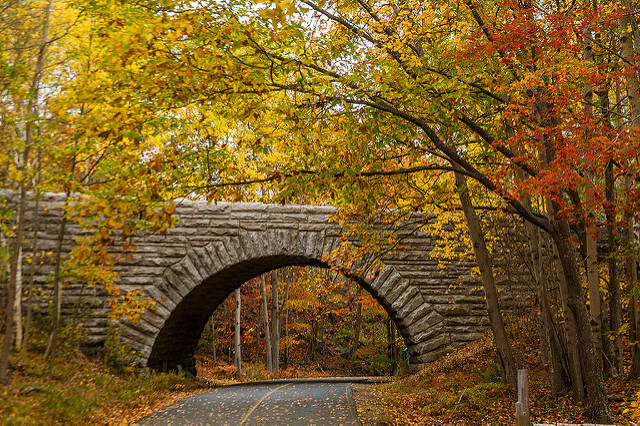 Between 1913 and 1940, a network of 57 miles of woodland carriage roads free from cars was constructed thanks to Rockefeller. Carriage roads can be accessed by horse, bicycle, or foot. There are over 120 miles of hiking trails ranging in difficulty from easy to very challenging. Almost all the hikes offer stunning views of the Atlantic Ocean and the many granite peaks of Mount Desert Island. 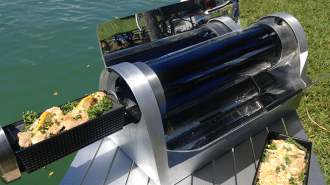 No Maine RV vacation is complete without a visit to the quaint cottage town of Bar Harbor where you can enjoy homemade blueberry pancakes and even lobster ice cream! Blackwoods Campground is one of Acadia National Park’s campgrounds and has campsites available for RVs. All sites are wooded and about a 10-minute walk to the ocean. During the summer months, you can use the free Island Explorer Shuttle around Mount Desert Island. Schoodic Woods Campground, on the mainland section of the park, is Acadia’s newest campground with 30 sites that can fit large RVs. In 1931, Governor Percival P. Baxter left 6,000 acres, including Mount Katahdin, to the State of Maine to create a state park. Over the years, he continued to purchase land and leave it to the State. Baxter State Park is now 209,644 acres and is home to Maine’s tallest mountain, picturesque fishing ponds and lakes, and miles and miles of hiking trails. Mount Katahdin stands at 5,269 feet and is one of the most iconic hikes in Maine. If you’re not ready for a strenuous hike, then there are other easy trails to hike and walk. With many waterways in the park, there is an abundance of kayaking, canoeing, and fishing available. Baxter State Park is also a prime spot in Maine to spot native wildlife like moose, deer, bald eagles, and more. None of the campgrounds in Baxter State Park have RV campsites, so you’ll have to stay outside of the park. Wilderness Edge Campground in Millinocket is just a 15-minute drive from the entrance of Baxter State Park and has 33 RV sites with water and electricity. The campground can even book you a moose excursion tour or a nearby waterway rafting trip. 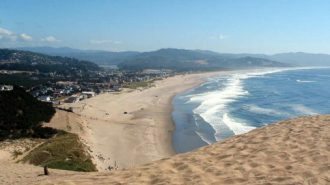 In the recent years, the city of Portland has made numerous top 10 lists of places to visit by travel magazines like Matador Network, Travel + Leisure, and more. If you like craft beer and good food then Portland needs to be on your Maine RV trip planner. Home to 17 microbreweries, Portland is the place to go for award-winning craft brews, mead, and wine. With hundreds of restaurants serving everything from fresh seafood to dim sum to delicious potato doughnuts, you certainly will not go hungry in Portland. The city is also home to a vibrant art scene, lots of walking trails, and charming boutique shops in the historic Old Port. 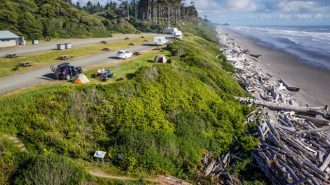 There are no campgrounds in Portland, but there are plenty of highly rated RV parks in nearby Scarborough. Bayley’s Camping Resort is always ranked in our top 10 campgrounds and RV parks in Maine and is one Maine’s largest campgrounds in the state, located close to the ocean, this luxury campground has multiple pools, fishing ponds, and tons of child-friendly activities every day. 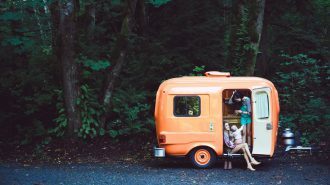 If you’re only in Portland for a day, check out our list of best places to park your RV in Maine. Camden Hills State Park is probably one of the most beautiful state parks in Maine. Located just a few minutes north of the idyllic New England town of Camden, Camden Hills State Park is a year-round park with miles of hiking trails, wildlife spotting, and boating. 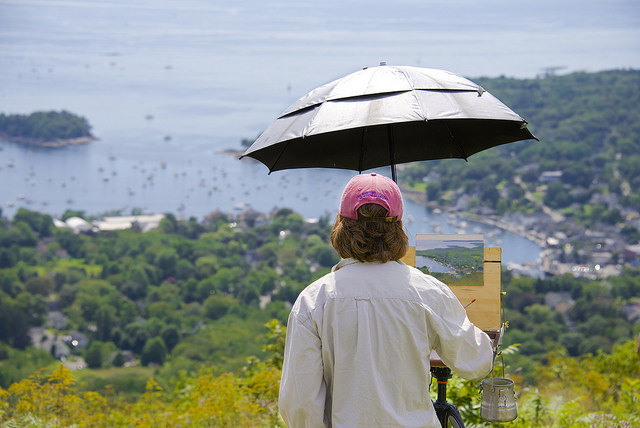 The panoramic views of Camden Harbor and Penobscot Bay on the top of Mt. Battie are unparalleled. Mount Megunticook is another great peak offer excellent views from the ledges of Ocean Lookout. The town of Camden and nearby Rockland and Rockport are perfect for exploring for seaside treasures and delicious local meals. You’ll find plenty of fresh seafood here! Camden Hills State Park Campground can accommodate RVs up to 35 feet long inside the state park’s campground. 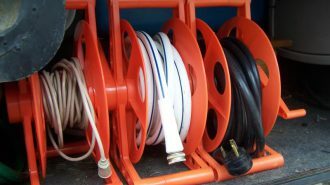 Each RV campsite has full hookups. Larger RVs should opt to stay at the modern Camden Hills Campground in Rockport. The park has full hookups, WiFi, a swimming pool, and is pet-friendly. Mount Blue State Park in the heart of western Maine is Maine’s largest state park encompassing over 8,000 acres. At the core of the park is the 3,187-foot Mt. Blue, which is a favorite day hike. 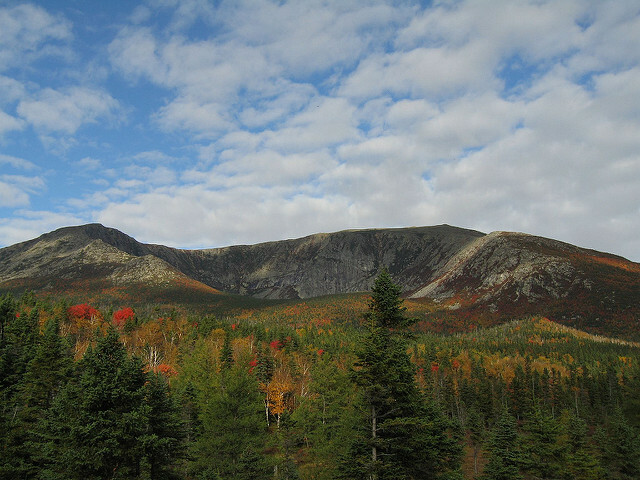 Nearby Tumbledown Mountain is also a very popular day or weekend hike. Webb Lake is a picturesque Maine lake perfect for boating, fishing, and swimming. With miles of trails open to mountain bikers, ATVs, and horses, there is a lot of family-fun to be had in western Maine. Mount Blue State Park is open year-round but is best for visiting during the summer and fall months. Mount Blue State Park has its own beautiful campground nestled on the sandy banks of Webb Lake with 136 wooded campsites just a short walk from the sandy swimming beach and picnic area. 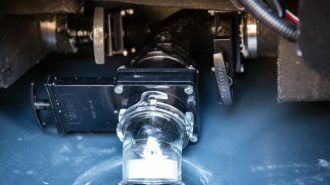 Many of the sites can accommodate RVs up to 35 feet long, but there is no water or electric hookups. Nothing screams “Maine” like a pair of classic L.L. Bean boots and a flannel shirt. If you can’t wait two months for your Bean boots, then make sure L.L. Bean is at the top of your Maine RV trip ideas as you can buy the boots you have been dreaming about for years in person at the L.L. Bean flagship store in Freeport. 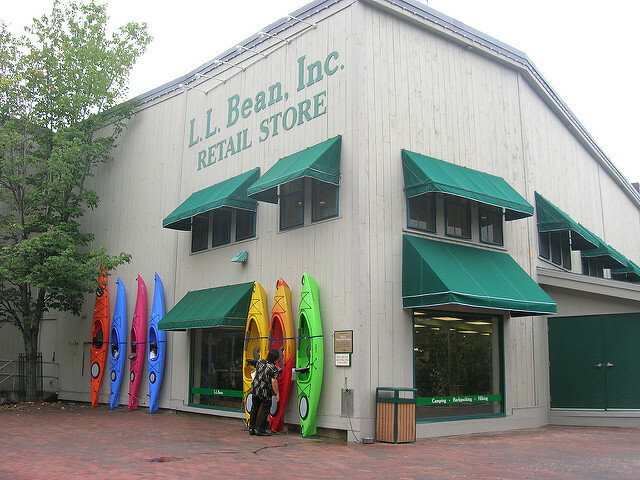 Once you’re done shopping for all your outdoor, home, and clothing needs at this classic Maine retailer, hit the Main Streets of Freeport for some of the best outlet shopping in the state. With tons of outlet shops like J. 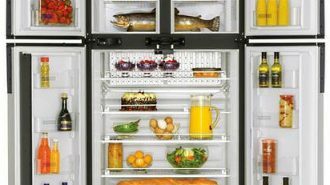 Crew, Brooks Brothers, Patagonia, and more, you might go broke. But, at least you’ll be fashionable! Cedar Haven Family Campground is the closest campground to downtown Freeport. Situated in the pine forests of coastal Maine, Cedar Have Family Campground offers an abundance of family activities like canoeing, hiking, and horseshoes. 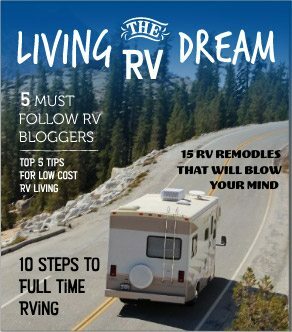 RV sites can accommodate large RVs and have full hookups. 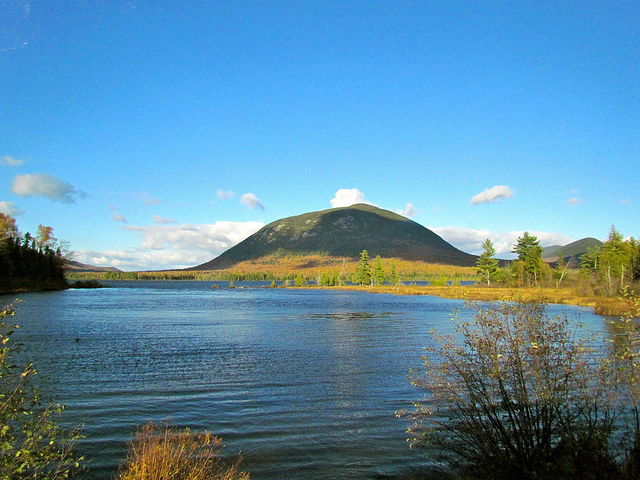 Moosehead Lake in Greenville is Maine’s largest lake. Recently named as the “top 11 places in the US to rent a summer house,” the Moosehead Lake Region is a scenic western Maine region with tons of incredible outdoor activities to do for the whole family. From boating and fishing on the lake to relaxing in a hammock at your campsite to moose spotting, Moosehead Lake Region is perfect RV destination for outdoor lovers. 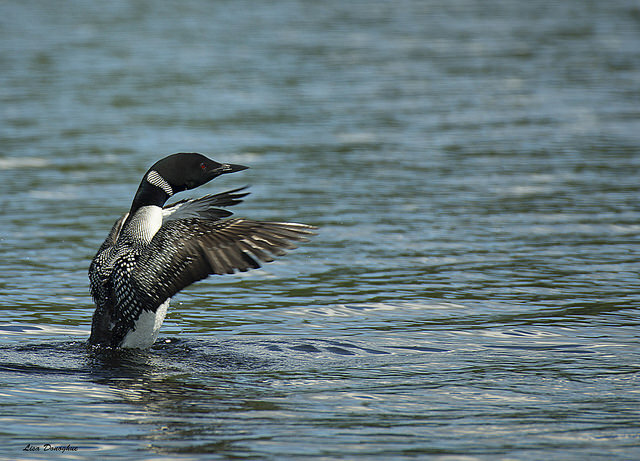 The region is home to many Maine native species like moose, black bears, beavers, and tons of hard-to-find bird species. The Appalachian Trail passes through Greenville on its way to Mount Katahdin, and there are tons of other great hiking trails with panoramic views of the region. Balsam Woods Campground is Moosehead Lake Region’s only campground with full hookups and free cable TV and WiFi. With a mix of 70 open, wooded, and pull-through sites, it’s the perfect place to park your RV for a few days or a week. From the campground, you can access over 1,000 miles of ATVs. 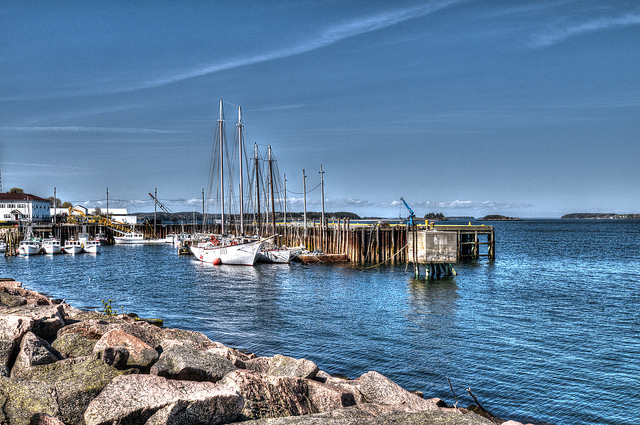 Eastport, Maine is the easternmost city in the United States. It may be a tiny town, but the town throws the largest US Independence Day celebration in Maine. Due to its location across the bay from Canada, the festival usually begins on Canada Day. The Eastport and Lubec region is also great for outdoor activities like whale watching, hiking, and boating. West Quoddy Head State Park is home to an iconic lighthouse and is ideal for an afternoon picnic. If you have your passport, then you can cross the bridge to Roosevelt Campobello International Park on Campobello Island. Seaview Campground & Cottages in Eastport is one of the best places to view America’s first sunrise. 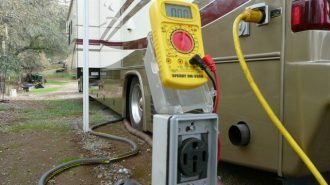 Their RV campsites have full hookups with electricity, water, and sewer. The campground has a private dock for boating and kayaking and is a great place to watch for whales. The Sunset Point RV Park in Lubec is the easternmost campground in the United States and has several oceanfront campsites overlooking Johnson Bay. Fort Williams Park is one of the most visited parks in Southern Maine. Nestled on the rocky coast of Cape Elizabeth, Fort Williams Park is home to Portland Head Light, Maine’s iconic lighthouse. Commissioned by George Washington, the lighthouse was completed in 1791 and is the oldest lighthouse in the state of Maine. Now fully automated, the lighthouse is on the National Register of Historic Places and is the most photographed lighthouses in the country. The Battery Keyes was built in 1906 as part of Fort Williams to protect the shores of Maine from attack. Now mostly in ruins, the Battery Keyes is a popular playground for young kids. Wild Duck Adult Campground and RV Park is perfect for honeymooners to retirees. Open seasonally from April to October, this campground in Scarborough has 70 campsites in the middle of Maine Audubon’s Scarborough Marsh. 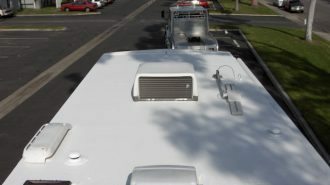 Each site is big rig friendly, has full hookups, and cable TV and WiFi. If you’re traveling with kids, try Bayley’s Camping Resort. 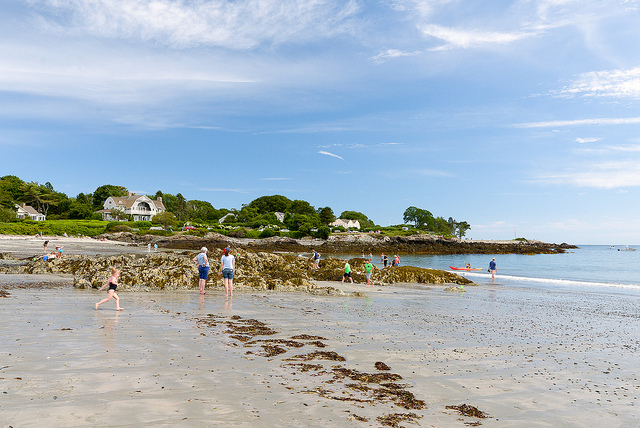 Maine is home to hundreds of quaint seaside towns, but none are as famous of Kennebunkport. The quaint coastal town is known for its charming downtown with tons of restaurants and boutique shops, Goose Rocks Beach, and the historic rustic stone chapel of St. Ann’s Episcopal Church. If you’re lucky, you might even catch a glimpse of Kennebunkport’s most famous summer residents, George H.W. Bush and his wife, Barbara. The nearby Seashore Trolley Museum is home to hundreds of historic trolley cars from all across the world and is a great activity for kids. Popular beaches in the area include Goochs Beach, Mothers Beach, and Camp Ellis Reach. 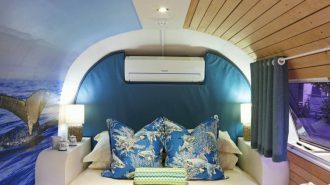 With tons to offer families of all ages, Kennebunkport and the surrounding region is the perfect destination for your Maine RV vacation. Hemlock Grove Campground in Kennebunkport provides “a Northern Maine atmosphere with Southern Maine convenience.” Nestled in the pine forests of Kennebunkport, you’ll feel like you’re camping in Northern Maine, but you’re just minutes from the nearest beach. Each campsite has full hookup, cable TV, and WiFi. Maine is a beautiful state to visit during the summer and fall months. You’ll find fantastic weather for lots of beach time in August making it the perfect time to take a Maine RV trip with kids. 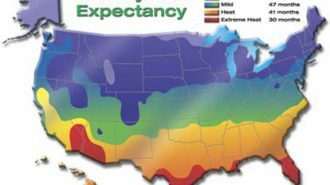 If you have more flexibility in your schedule, stay in Maine for the incredible changing of the leaves. The fall foliage in western Maine is some of the best in the country and is the perfect reason to come to the state for your Maine RV road trip.